Introducing Forbes’ new Tables & Induction Furniture, the solution to your overhead overages. Forbes has worked tirelessly to lower the costs of the equipment that you need to keep your operation running smoothly and efficiently every day, while maintaining the quality and durability that Forbes’ products are famous for. Through meticulous value-engineering, savvy consolidation of materials purchasing, and increasingly efficient manufacturing processes we have been able to lower our expenses across the board and pass the savings along to our valued customers. The Forbes Express Line Catering Table comes in one of two finishes; "Negotiating in Geneva" or "Thunderstorm" high pressure laminate. This catering table is equipped with black T-molding to protect the edges and black powder epoxy steel legs with 4" swivel casters make this table ideal for quick setup and stow away. All express line products ship in one week or less. Embrace the free spirit of the tropical islands and coastal living with the Fiji Series. The leg frames on these tables drive the natural look and feel of the tropics with a stylistic solid wood slat design, combined with steel reinforced brackets to provide the strength and durability youve come to expect from Forbes. Finish your tables off with our vast selection of wood laminate options to personalize your look and create a one-of-a-kind set of furniture that will enhance your decor for years to come. Shown here as the Executive Series (model 7434) with Wedding Cake high pressure laminate top. 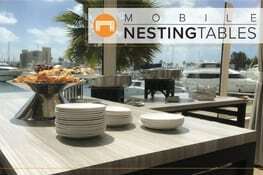 Bring fashion and function to your venue with the Claremont Nesting Tables by Forbes Industries. The Claremont Series is inspired by the diverse scene of sunny Southern California and is designed to fit virtually any decor. A set of four brushed stainless steel nesting tables with beautiful Acacia Driftwood tops provides functionality and versatility for any property or event. Embrace rustic charm and warmth accompanied by modern craftsmanship with the Rustica Series. These tables are offered with a rustic vintage wood top paired with black pipe leg frames, and our specially sourced vintage style casters. These unique casters feature a worn look with intentional imperfections and a special polyurethane tread so that they wont damage your floors. If these tables could talk, were sure theyd have some stories to tell. With its minimalistic design and unique nesting companion tables, the Foss Series is destined to be the focal point of the room. The Foss Series was inspired by Northern European design and was named after the Norwegian word for waterfall. It boasts a contemporary look with clean lines and stylistic waterfall countertop edges that are sure to add a sleek and refreshing statement to your decor. These lineless catering/banquet tables feature a robust 1.5" brushed stainless steel square tube frame, sleek 3" chrome plated casters, and your choice of beautiful wood veneer finish. Shown here as the Executive series (model 7414) with Lunar Legno high pressure laminate finish. Bring fashion and function to your venue with the Claremont Nesting Tables by Forbes Industries. The Claremont Series is inspired by the diverse scene of sunny Southern California and is designed to fit virtually any decor. A set of three brushed stainless steel nesting tables with beautiful Acacia Driftwood tops provides functionality and versatility for any property or event. Shown here as Executive model 7405 with Pyreneese Marble laminate tops. Table wood veneer with Trend Glass/Stone countertop, curved front cabinet, 5" gray wheels are standard. Shown with optional induction units - sold separately. Inductions sold separately. If purchasing inductions, Trend Glass countertop is required. Table wood veneer with Trend Glass/Stone countertop, open cabinet, straight corners supports, bottom shelf, four fixed corner bumpers, 5" gray wheels are standard. Inductions sold separately. If purchasing inductions, Trend Glass countertop is required. Mobile Tables (nestable - 6-ft) with Stainless steel framed laminate tabletop, 3" chrome hooded caster. Trend Glass and Trend Stone available on most models, some restrictions and additional costs may apply. Table wood veneer with Trend Glass/Stone countertop framed in solid wood molding, enclosed cabinet with doors, middle and bottom shelf, tapered corners supports, 5" gray wheels are standard. Inductions sold separately. If purchasing inductions, Trend Glass countertop is required. Table wood veneer with Trend Glass/Stone countertop framed in solid wood molding, 3-sided cabinet with middle and bottom shelf, tapered corners supports, 5" gray wheels are standard. Inductions sold separately. If purchasing inductions, Trend Glass countertop is required. Table wood veneer with Trend Glass/Stone countertop framed in solid wood molding, open cabinet with middle and bottom shelf, tapered corners supports, 5" gray wheels are standard. Inductions sold separately. Inductions sold separately. If purchasing inductions, Trend Glass countertop is required. Table wood veneer with Trend Glass/Stone countertop framed in solid wood molding, open cabinet with bottom shelf, tapered corners supports, 5" gray wheels are standard. Inductions sold separately. If purchasing inductions, Trend Glass countertop is required. 6-ft. Catering Table - ultra H.D. welded construction, brushed stainless steel frame, two-tier top (CENTERED), vinyl-dipped utility shelves and 5" black non-marking wheels with two brakes. Folds up to 17"W x 65.5"H.
8-ft. Catering Table - ultra H.D. welded construction, brushed stainless steel frame, two-tier top, vinyl-dipped utility shelves and 5" black non-marking wheels with two brakes. Folds up to 17"W x 77.5"H.
6-ft. Catering Table - ultra H.D. welded construction, brushed stainless steel frame, two-tier top, vinyl-dipped utility shelves and 5" black non-marking wheels with two brakes. Folds up to 17"W x 65.5"H.
8-ft. Catering Table - ultra H.D. welded construction, brushed stainless steel frame, single level, vinyl-dipped utility shelves and 5" black non-marking wheels with two brakes. Folds up to 17"W x 64"H.
6-ft. Catering Table - ultra H.D. welded construction, brushed stainless steel frame, single level, vinyl-dipped utility shelves and 5" black non-marking wheels with two brakes. Folds up to 17"W x 52.5"H.
Deluxe Catering Table w/folding legs, solid knotty pine (distressed), Mahogany finish. This model is available through our Quick Ship Program. For all other color configurations our standard leadtimes apply.